Summary (from Goodreads): Sitting in the honored stalls of the Crystal Sanctuary, Calvin Gooding should be rejoicing in the message he receives from the Holy King of Duprin. But his heart is heavy. He awaits the carriage in which he must ride to deliver the fated news to his family. Time has run out. In the midst of this sorrow, exhaustion, and uncertainty, a sorceress from the Dark Province appears to Calvin. She promises to make his terminally ill twin sister, Marilyn, well again. As twins, Calvin and Mari share a special bond, and Calvin will do almost anything to save his sister's life. But in order to free Mari from death's grip, the sorceress claims that Calvin must travel to the Dark Province-a land where souls and flesh are devoured by the lawless and the spirit of man is bound in shackles. It's a reckless land dominated by morally corrupt warlords and open sexuality. Wrapped tightly in his religion, Calvin must make a life-altering decision. He can choose to follow the sorceress into the sinful abyss to save his sister, or he can accept a life of guilt and certain torment over Mari's death. Calvin's twin sister Marilyn (Mari) has been his best friend since the moment they were born. They spent their childhoods together, being raised by their two faithful Duprinite parents. Even after they go their separate ways, Calvin and Mari keep in touch, writing countless letters back and forth, discussing every topic under the moon. Then Mari falls ill. She sends Calvin a vague letter, telling him she is ill and requests his presence. Calvin heeds these instructions and sets off to visit his sister, finding her bed-ridden and sickly. After meeting with the doctor responsible for Mari's care, Calvin's worst fears are confirmed - his sister is fatally ill, and there is nothing anyone can do to save her. But then Mari has a dream, and Calvin is convinced that it contains a prophecy of sorts - if he fulfills it, Mari will be healed. With only his faith and a promise to his sister to keep him going, Calvin sets off, hoping he will be able to succeed before he loses Mari forever. 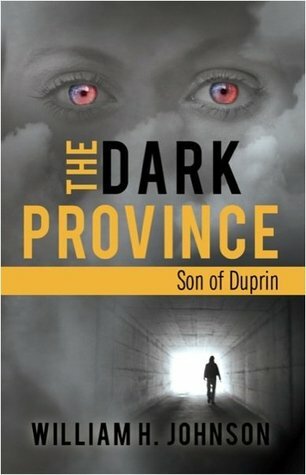 My Thoughts: The Dark Province: Son of Duprin was an amazing novel. The ability of the author to create such a rich setting was amazing - I felt like I was right there with Calvin, struggling to maintain my faith amid all the corruption. The author is extremely talented; you would never guess that this is his debut novel! Calvin was a great character - I love the idea that he starts off with a solid, unnerving faith, and by the end he is questioning everything he thought he knew, because I think everyone can relate to this is one way or another - who can honestly say they haven't struggled with their faith, especially in times of hardship? Watching his struggles makes Calvin seems so much more real to the reader, and I'm glad the author didn't try to make Calvin seem like some unchanged, perfect saint throughout the novel. And unlike some authors, Johnson's other characters didn't pale in comparison to the main character - they were well-developed and added extra depth to the novel. Final Thoughts: The Dark Province: Son of Duprin is definitely one of my favourite adult novels. I recommend it to anyone looking for a deep read that really makes you think. I'm eagerly waiting the sequel!